The autumn period has been a turbulent and strenuous time for the Golden Age Gorinchem Foundation. A great deal of time was spent on tracking down new paintings for possible acquisition. In addition, the Golden Age Team has visited two lectures in Amsterdam, a new sponsorship contract has been signed with the Rabobank and a new loan agreement with the Gorcum Foundation FOWW (Fonds Ontwikkeling Wonen & Welzijn; Fund for Development Living & Welfare). Furthermore, we have received several guests in Gorcum, such as the art historian and Harmanus Serin-expert Drs. Jim van der Meer Mohr and the painter Fer Hakkaart and his wife Ineke from Leiden. The Golden Age Team has traced two paintings from well-known Masters from Gorcum that were offered at auctions in Europe. The paintings were in itself very interesting but thanks to the sharp eye of one of the Team members, Mrs. Annet Ardesch, we questioned the condition of the works. Since there are always issues with the condition of 17th century paintings – such as the consequences of re-canvassing, the condition of the panel or revisions – we have asked a few experts to look at the state of the paintings on site. From an art historic point of view the paintings were very valuable, but, after considering it carefully, we have decided not to look further into buying them. The Golden Age Team has traced two paintings from well-known Masters from Gorcum that were offered at auctions in Europe. The paintings were in itself very interesting but thanks to the sharp eye of one of the Team members, Mrs. Annet Ardesch, we questioned the condition of the works. Since there are always issues with the condition of 17th century paintings – such as the consequences of re-canvassing, the condition of the panel or revisions –– we have asked a few experts to look at the state of the paintings on site. From an art historic point of view the paintings were very valuable, but, after considering it carefully, we have decided not to look further into buying them. The painting below, by Jan Olis, the first work of this artist that became part of Gorcum’s collection, shows a magnificent mug, executed in a Rembrandtesque manner. The painting, oil on panel, size 35 x 28 cm, has been signed with ‘Jolis’ on the right side. On 1 October last, the art historian Drs. Jim van der Meer Mohr visited the Golden Age Team regarding the recent acquisition of the portrait of the ‘schepen’ (alderman) Hubertus Snoeck from Gorcum from 1736, a painting by Hermanus Serin. Since Mr. Van der Meer Mohr is writing his PhD thesis about this painter, under supervision of Prof. Dr. R. Eckhart, it was interesting for him to investigate the work that we acquired in May 2009 and that now hangs in the Gorcums Museum. See www.vandermeermohr.nl for more information about Harmanus Serin. The Golden Age Team has attended, on 22 October, the annual lecture of the Rembrandt Society in the auditorium of the University of Amsterdam. On this occasion, the future director of the Stedelijk Museum, Mrs. Ann Goldstein, gave a presentation about her view on managing a museum. In a discussion with Prof. Dr. Peter Hecht, she emphasised the necessity of a good relationship with collectors who are well disposed towards the museum. The Golden Age Team can wholeheartedly agree with this point of view. 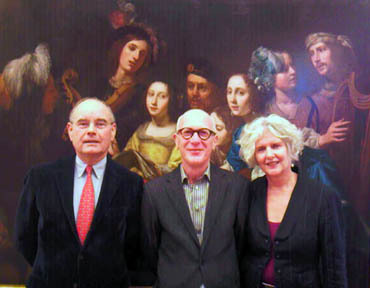 The Golden Age Team has attended, on 22 October, the annual lecture of the Rembrandt Society in the auditorium of the University of Amsterdam. On this occasion, the future director of the Stedelijk Museum, Mrs. Ann Goldstein, gave a presentation about her view on managing a museum. In a discussion with Prof. Dr. Peter Hecht, she emphasised the necessity of a good relationship with collectors who are well disposed towards the museum. The Golden Age Team can wholeheartedly agree with this point of view. 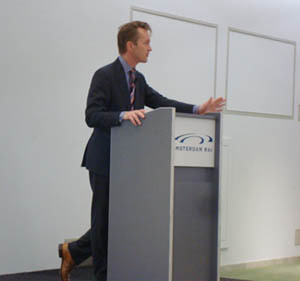 On 30 October last, Bert Biemans has explained the activities in 2009 of The Golden Age Gorinchem Foundation during a board meeting of the Van Andel Spruijt Foundation. On 18 November last, Mr. Fer Hakkaart, painter from the Dullebakkersteeg in Leiden, visited the Gorcums Museum, together with his wife Ineke. In the museum they admired the recently acquired 17th century Old Masters from Gorcum. 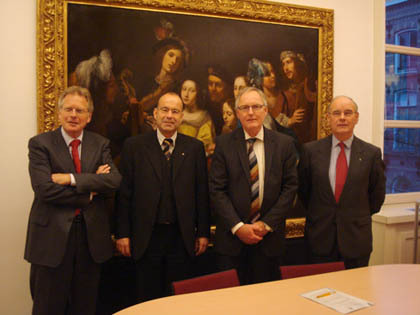 They were very impressed by the painting of Gerard van Kuijl, which was lend to the museum by Mr. Rob Smeets, art-dealer in Geneva. For those who are interested in contemporary painting, the website of Fer Hakkaart, www.ferhakkaart.nl, een goed overzicht van zijn werk. On 22 November last, the Golden Age Team went to the PAN (the most important national art and antiques fair in the Netherlands) in the RAI in Amsterdam where the members of the Team attended a lecture by the head of the directorate of the Rijksmuseum, Drs. Wim Pijbes. One of the things he brought up were the large amounts that are nowadays involved in important art objects and the limited budgets of the museums in the Netherlands. This reminded us once again of the difficult task our Foundation has to acquire good 17th century paintings for Gorinchem. 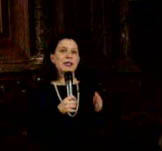 Mr. Pijbes also emphasised the necessity of, as a museum director, keeping the relations with collectors strong, just like Mrs. Ann Goldstein had stated in her lecture of 22 October. One of the members of the Golden Age Team asked Mr. Pijbes after his presentation whether the Rijksmuseum (www.rijksmuseum.nl) was going to have a satellite museum in one of the Gulf States, just like the Louvre in Paris is trying to bring about. Mr. Pijbes answered that, for the time being, this was not on the agenda. Geopolitical issues will have played a certain role in the decision making process of the Louvre. On 25 November last, the board of the Golden Age Gorinchem Foundation has signed a sponsorship contract with the Rabobank Alblasserwaard North and East. The director, Mr. P. Hoogendoorn, emphasised during this meeting the importance of the 17th century painters from Gorcum, all the more because these artists have also painted the surroundings of Gorcum. Exhibiting these paintings in a museum environment will not only create appreciation for the past with the citizens of Gorcum, but also with the population of the surrounding area. The Rabobank is the third local organisation that sponsors the Foundation. With this we hope to have created a firm base to apply for funding with organisations on a national level. On 22 December last, the board of the Foundation signed a loan agreement with the Gorcum Foundation FOWW (Stichting Fonds Ontwikkeling Wonen & Welzijn; Foundation Fund for Development Living & Welfare). 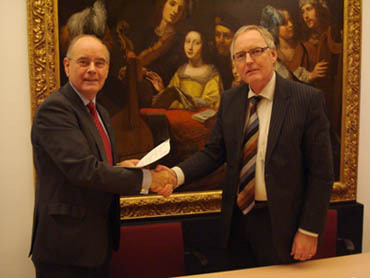 This agreement gives the Golden Age Gorinchem Foundation more control over the paintings, financed by the FOWW, that the Gorcums Museum has borrowed. We, as the board, are honoured with the trust that was put in us.